When I lived in Southeast Asia, I wanted to visit Burma, but the official word from the democratic opposition was that foreigners should stay away as part of a general boycott of the military regime. I'm not sure whether that particular form of sanction is productive or not, but that's what they ask, so that's what we observed. While democratic revolutions swept the world at the end of the 1980s, Burma has thus far been unable to redeem its failed uprising of 1988. 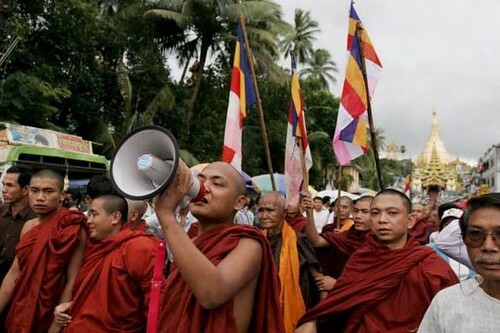 The current demonstrations by the Buddhist monks -- the only institution in the country with anything close to the influence of the military -- offer the best chance since then to force open the door to freedom. Thailand-based Irrawaddy News Magazine is an excellent source for coverage of the ongoing developments, and of Burma in general. Cross-posted at Alien The Right's Field. Democratic candidates offer a wealth of ideas, explained in rich detail. Republicans offer a few vague platitudes and promise to get back to us after the election. I’m not sure Republicans are wrong about this. When a GOP candidates says, “Vote for me — and I’ll work out the details later,” I’d love for there to be consequences. There never are. In 2000, Bush’s vague and ambiguous tax plan didn’t make any sense. Al Gore tried to make it a campaign issue, but the media ignored it and voters didn’t care. In 2004, Bush said more than once that he could privatize Social Security without raising taxes, raising the deficit, cutting benefits, or raising the retirement age. How did he propose to pull that off? He didn’t — he just mentioned ideas and goals without any details. There were no political consequences. In fact, American voters don’t seem to care all that much about the details in advance. A candidate talks about what he or she finds important, and how he or she would approach the issue if elected. Voters either agree or disagree. If a candidate were to make some kind of outlandish campaign promise — free ice cream for everyone, every day, for four years — there would probably be a higher expectation to explain how that might work, but a more general policy prescription needs a lot fewer support materials. One of the neat tricks Republicans managed to pull off during much of the past decade or two was to earn a reputation as both the party of principles and the party of ideas. Logically, those two things may be connected, but as Benen's analysis suggests, in a practical sense it can be difficult to wear both hats at the same time. When you spend a lot of time on wonky policy details, it can be hard to express basic foundational principles in a clear way. At the same time, when all you talk about are principles, your rhetoric can be so divorced from reality that it becomes meaningless. This is just an impression, but I think that Republicans, having achieved a reasonable sense of balance between principles and ideas for quite some time, are tilting over into meaningless abstractness at this point. Much of this has to do with the exhaustion of the Goldwater conservative movement, which seems finally to have reached its Waterloo in the era of Bush the Lesser. Movement conservative ideas simply came to their logical and practical limits -- if the ideas worked, Bush would have implemented them successfully. They didn't and he couldn't, and all the rest of what conservatives say about it is just excuse-making. Does anybody really think there's a future in social security privatization or "health savings accounts"? Honestly? Bush knew that conservatives couldn't simply slash away the social insurance state, but the price of a politically-feasible transition was too much for the right's ideology to bear -- as the Part D debacle proved. And that was just a preview of the costs that would be associated with any privatization of social security. There just isn't any way to remake America along Goldwater-conservative ideological lines. You can't go back again. There are new, young conservatives out there with some interesting (if embryonic) ideas of their own, but they aren't influential enough yet to have much impact on the presidential race, so what we're left with is a field of candidates repeating the rhetoric of conservative years past, even as that rhetoric has lost its relevance to the details of governance. Republicans are usually the party that attracts those who crave transcendence and the appeal of pure ideology. Democrats are usually the party of pragmatism, ideological muddle, and practical government. There's nothing wrong with that basic dichotomy. A party gains an advantage when it is able to reach beyond its basic mode and do a little bit of what its opponent can do -- a strong GOP has at least some good, wonky ideas, and a strong Democratic party has at least some ability to appeal to the voters' civic-spiritual side. My point is that Benen may be right, but he's thinking of a Republican party that was able to achieve that balance more effectively. Even just in the past couple of years it has lost the balance. Both its domestic agenda and its foreign-policy credibility have come undone. I'd like Democrats to talk about principles more, but let's let them be the party of details, too. In the end, details do matter. This Media Matters report won't surprise you, but it should infuriate you. They actually contacted almost every daily newspaper in the U.S. on an individual basis to collect the data to show that conservatives are greatly over-represented in the opinion pages. On the plus side, I remember coming of age in the 90s just knowing this was true -- it was obvious -- but back then it seemed like there was hardly anyone willing to say or do anything about it. That, at least, has changed. Sixty percent of the nation's daily newspapers print more conservative syndicated columnists every week than progressive syndicated columnists. Only 20 percent run more progressives than conservatives, while the remaining 20 percent are evenly balanced. In a given week, nationally syndicated progressive columnists are published in newspapers with a combined total circulation of 125 million. Conservative columnists, on the other hand, are published in newspapers with a combined total circulation of more than 152 million. The ten-thousand pound gorilla in all this is -- again, no surprise -- George Will, who reaches half of America's newspaper readers, which comes out to slightly more readers than Alien & Sedition reaches in an average millenium. Editor & Publisher reports on the report; the article interviews Alan Shearer, editorial director of the Washington Post Writers Group, which syndicates Will and other columnists. Shearer suggests that the bias comes about largely because newspapers publishers themselves tend to have conservative leanings. MyDD's Shai Sachs offers a more nuanced analysis, examining the effects of regional variation and the syndication business -- noting that "the real winner is the Washington Post Writers Group." I'd be very interested to see a liberal entrepreneur create a new syndicate to compete with the titans of the syndication industry. Certainly, the raw materials for such a company are in abundance: the progressive blogosphere is well-stocked with a diverse collection of intelligent, articulate writers who can give George Will and Cal Thomas a run for their money. Aside from a chorus of fresh progressive voices, such a syndicate could offer services like localization (helping newspapers identify columnists in their region), integration with social networking sites, and increased writer/reader interaction. No doubt, it would be tough to drum up business, but I think it would be an interesting experiment, and it could help restore balance on op-ed pages. I can't stress enough how important this kind of thinking is (and, again, how different from the hopeless 90's). One of the most fundamental lessons one learns, studying the conservative movment, is that when a movement is shut out from existing institutions, it must innovate. This Media Matters report is an opportunity for progressives, not to complain about how unfair the world is, but to develop innovative strategies to get around that unfairness. A&S is on hiatus for the next few days, but we'll be back soon. NY Times Ending "Times Select"
A good decision by the Paper of Record. I don't know about you but I'm begining to get the impression that much of the Republican field just doesn't care for debates and forums. If it's not a choreographed staging of tightly scripted interactions with supporters enthusiastically waving campaign paraphernalia they're just not interested. I agree, and it certainly has something to do with why the GOP candidates have been so leery of the YouTube debate. But the snub to nonwhite voters is worthy of notice over and above any general reluctance to debate. As president, George W. Bush has done little but damage to minority interests. But as a politician, he has been unusually keen -- for a Republican -- to win minority support (no, it doesn't add up, but that's par for his incompetent course). Right from the 2000 campaign, Bush and his advisors have made it a point to reach out symbolically to African-American and Hispanic voters (who can forget the demographics onstage during the RNC in Philly? ), while his surrogates in the conservative movement work to convince their compatriots of the importance of gaining votes among those constituencies. Such efforts were not fueled by the Bushies' personal hunger to improve race relations, but by cold hard electoral math. But so far in this 2008 cycle the GOP has presented nonwhite voters not with a friendly face, but with a series of cold shoulders. While it's clear to anyone who keeps up with intra-conservative debate that any candidate hoping to win the nomination will have to distance himself from a good number of Bush's perceived sins against the right -- not least of them his embrace of so-called "big-government conservatism" -- it's remarkable to think that the effort to expand the GOP beyond its white Christian base may be considered one of those sins. Perhaps it's because, in the end, the administration's effort failed. But that doesn't change the math. Bush tried and failed. The current Republican contenders aren't even going to try. In an Opinion Journal piece reprinted from Commentary, Kay Hymowitz offers a notable exercise in conservative critique of libertarianism. It's timely: as Hymowitz herself observes, with the growth of the internet as a political medium (and for a number of other reasons), the libertarian voice in conservative discourse is more prominent now than it has been in quite some time. In her review of two new books by prominent libertarians (Radicals for Capitalism by Brian Doherty, and The Age of Abundance by Cato's Brink Lindsey), Hymowitz, unsurprisingly, does not take particular issue with the authors' economic analysis. I've added Lindsey's book to my long list and will discuss its economic aspects in more detail when I get to it (it may be a while), but the most interesting part of Hymowitz's review is her focus on "the cultural contradictions of libertarianism." Despite Mr. Lindsey's protestations to the contrary, libertarianism has supported, always implicitly and often with an enthusiastic hurrah, the "Aquarian" excesses that he now decries. Many of the movement's devotees were deeply involved in the radicalism of the 1960s. Nor should this come as a surprise. After all, the libertarian vision of personal morality--described by Mr. Doherty as "People ought to be free to do whatever the hell they want, mostly, as long as they aren't hurting anyone else"--is not far removed from "if it feels good, do it," the cri de coeur of the Aquarians. To be sure, part of the libertarian entanglement with the radicalism of the 1960s stemmed from the movement's opposition to both the Vietnam War and the draft, which Milton Friedman likened to slavery. But libertarians were also drawn to the left's revolutionary social posture. But of course this simply isn't true. There's a universe of difference between "do what you will so long as you cause no harm to others," and "if it feels good, do it." It seems that the failure to understand this difference is what defines a social conservative, and this is why liberals (including, in this case, libertarians) have such mistrust for conservatives: those who cannot recognize such boundaries cannot be trusted either as moral agents on their own, nor as the guardians of others' morality. On the one hand, libertarians make a fetish of freedom; it is their totalizing goal. On the other hand, libertarians depend on the family--an institution that, in crucial respects, is unfree--to produce the sort of people best suited to life in a free-market system (not to mention future members of their own movement). The complex, dynamic economy that libertarians have done so much to expand needs highly advanced human capital--that is, individuals of great moral, cognitive and emotional sophistication. Reams of social-science research prove that these qualities are best produced in traditional families with married parents. Family breakdown, by contrast, limits the accumulation of such human capital. Worse, divorce and out-of-wedlock childbearing leave the door wide open for big government. Dysfunctional families create an increased demand for state-funded food, housing and medical subsidies, which libertarians reject on principle. And in courts all over the country, judges who preside over the manifold disputes occasioned by broken families are forced to be more intrusive than the worst mother-in-law: They decide who should have primary custody, who gets a child on Christmas or summer holidays, whether a child should take piano lessons, go to Hebrew school, move to California, or speak to her grandmother on the phone. It is a libertarian's worst nightmare. Hymowitz disputes Lindsey's assertion that "the instincts and abilities for liberty . . . are innate," arguing that such attributes can only be instilled in children who are properly raised by proper families. Few libertarians, I suspect, would argue that strong traditional family structures are a bad thing. In fact, I’d bet that the vast majority of them would be perfectly pleased to find families doing well. But I think a number of them would resist the idea that, somehow, there’s a social obligation to perpetuate the traditional family structure, and most would also argue that other forms of social arrangements are worth allowing, and might even prove fruitful. This stance might be less supportive of deploying government muscle in order to advance one's personal preferences than some would like, but it's hardly anti-family. Suderman helpfully points out that the old fusionist equation -- "when families fail, government steps in" -- does not express the only government threat to the family; another is presented by the overbearing efforts of conservatives to ensure that everyone's family is socially correct. In fairness to the libertarians, labels such as pro-family and anti-family are absurd in a way. There are significant social and political consequences that result from legal and property arrangements that bind large, extended families together or from those that encourage the break-up of a household into many separate households. A public authority worried about the dangers of corruption, nepotism and civil strife created by extended family networks would implement laws to discourage that kind of family life, which might earn it the "anti-family" designation from those adversely affected by the change, while a booster of state authority might define it as a pro-family measure if he redefines what family is. Public authority has a vested interest in governing what kinds of families exist, because the different forms of families have consequences for social and political life that extend beyond the walls of the family home. The point is that every act of legal recognition, permission or reinforcement of this or that social arrangement is equally "artificial" in one sense, and the decision to not privilege one form over another is a decision by default to support the emergence of alternative forms. Larison recognizes one of the fundamental flaws of libertarian theory in general: there is no such thing as public neutrality on most issues. For Larison, the important question is "whether there are certain kinds of family life that are most conducive to human flourishing" -- as a genuine social conservative, he believes that the argument is unavoidable and worth having, and if we've come to an agreement, then the question is how to get government to encourage the best kind of family life. Liberals, of course, apply the same critique to libertarian economic theory: the idea that government can avoid substantive engagement in the economy is simply nonsense. Even when it refuses to choose, it thereby tacitly makes a choice in someone's favor. And in a certain sense, we agree with Larison on the fact that government is inevitably involved in social matters as well. But "do as you will but cause no harm to others," properly understood, has very different consequences in economics than in the purely social sphere. I still believe that, despite the optimism of the current crop of libertarians, they'll never really challenge the social conservatives for dominance on the right -- though I should note that by "social conservatives" I don't mean Christian fundamentalists per se; the latter are just a subset of the former, and their political import is likely to change significantly over the coming years. But at any rate, if the libertarians force social conservatives to more critically examine their assumptions about ideal social order, they will have done us all a favor. Hoover Institution fellow and former Reagan advisor Richard Allen has a rambling endorsement of Fred Thompson at the National Review. The point of the piece is to validate the Thompson-as-Reagan idea, but it mainly consists of nostalgic anecdotes about the political genius of the Gipper. Allen says little of substance about Thompson (despite mentioning that he's known him "for many years"), and the whole thing comes off as illustrative of precisely the mindset Thompson must be counting on among conservatives: a willingness to suspend disbelief, fueled by ever-fuzzier and ever-fonder memories of That Other Actor. It is undoubtedly too early to attribute the same comprehensive and plain-spoken vision to Fred Thompson, although his out-of-the gates speeches and remarks are very reminiscent of Reagan. But if they are there in Thompson they will reveal themselves; the Reagan qualities cannot be feigned or sustained for very long. Deep conviction will always be apparent as a campaign wears on, and the scarcity of it thus far in the wildly early presidential race has been conspicuous by its absence. I've talked about the performativity of modern conservatism a great deal, but what's particularly interesting is how that acting is linked to a sense of conviction. The latter is seen as superior to knowledge, experience, discretion, or skepticism; it's a quality to be treasured in a leader and emulated in practice. But because it trumps knowledge, experience, discretion, and skepticism, because it triumphs over them, conservative conviction ends up being fixed to nothing, really, beyond a self-referential concept of abstract principles. I believe in individual freedom; the meaning and consequences of that statement of belief have nothing to do with testable results and everything to do with how well I project my conviction in that belief. That's why, when we talk about conservative performativity, about conservatives as actors, it doesn't mean we're calling them phonies (except for those, like Mitt Romney, who really are phonies). They genuinely believe in their act, and they act to maintain their belief in their beliefs. I know this is both abstract and probably well across the line into pop psychology. But I think it also has a lot to do with why Fred Thompson, despite his dismal resume and his disorganized campaign, has such purchase on the conservative imagination. Allow me to indulge in a blogger cliche: sorry for the lack of posts recently. I'm beginning something of a career transition and it's taking a toll on my blogging time; what time I've had lately has mostly been spent over at The Right's Field, where I've been writing about the Republican presidential field. Despite a few notable incoming links, A&S remains a low-traffic blog, which is fine, but it also means it's harder to write when I'm less energetic. I expect to continue to use this site to post in-depth analysis of the conservative movement, but the pace around here will be slow for a while. I'm not going away -- I just want to make sure that what I do post is high-quality. In the longer-term future, I might look at ways to expand this project beyond the limited efforts I'm able to make here. At any rate, have you read this article by TNR's Peter Keating? He explains his skepticism of claims that either Rudy Giuliani or Barack Obama can really change the American electoral math. Given that one bias in political analysis is to overestimate so-called "re-alignments," I'd say his arguments are worth taking seriously. Do liberals and conservatives think differently? Yes, according to yet another study. I have mixed feelings about this sort of thing. I largely agree with Peter Suderman, who wonders: what's the point? But other than giving the blogosphere a secondary story to argue about this week during breaks from analyzing the Patraeus Bush report, there doesn't seem to be too much point to these stories. Yes, conservatives and liberals are different, and some of their differences can ocassionally be shown in stastical form. How novel. The study's lead author attempts to soften the blow for conservatives by suggesting that their resistance to new information might be useful in certain situations that require focus. But when we're talking about who has his finger on the button, would you really ever want somebody who insists on seeing an M when they should be seeing a W? But then again, so what? Should we insist on cognitive therapy for conservatives? Isn't that what politics is supposed to be? Of course the study's authors aren't claiming that conservatives are mentally ill, and rightly not. While we might like to tell ourselves that -- say after a bad election night -- it doesn't really lead us anywhere useful. For all the fun we in the netroots can have watching the Republican sideshow, we forget that they aren't doing it for our own amusement. They're trying to win support from the right. And with that in mind, here's a sample of conservative reaction to last night's Donnybrook in Durham. The frontrunners are confident, likeable, articulate - conservative enough on issues. Will be interesting to see reactions from Frank Luntz's focus group - more representative than most of us. Not only did the individual candidates do poorly, but the field performed badly as a whole. After the debate, not one of pollster Frank Luntz’s 29 focus-group members expressed satisfaction with the men on the stage. Freddoso, as the excerpt above suggests, takes a grim view of the entire exercise. The winner -- "by attrition" -- was John McCain, a man with virtually no prospect of climbing his way back into the lead. Huckabee was "unimpressive," Duncan Hunter "bored the crowd," and Sam Brownback "said nothing that anyone will remember tomorrow." Romney blew a question on taxes, was forced to squirm when confronted by a servicemember's father, and worst of all, "even [his] normally perfect hair was a bit askew." And Rudy? It wasn't all doom and gloom. Mona Charen liked the exchange between Huckabee and Ron Paul over Iraq, and thought that McCain "managed to make [Romney] look like an overly tentative technocrat." John Pitney, though (same article), seems to think that Rudy could use some more practice weaseling out of questions about his personal life. NRO's Jim Geraghty gives the gold to an "unflappable" Rudy, while pouring scorn on the highly-flappable Tom Tancredo, whom he describes as "an eyeball-popping, jumpy, loud, jittery 1970s sitcom character." Geraghty has praise for Huckabee's "charisma" and McCain's "solid"-ity, but thinks Romney had "an off-night," especially on Iraq. NR Editor Rich Lowry, meanwhile, calls it for McCain, agrees that Romney was "wobbly" on Iraq, and says he dug Rudy, but he wishes the man would shut up about New York already. Whaddya gonna do, Rudy? People are tired of hearing you bang on about 9/11 all the time. Now they're tired of hearing you bang on about being mayor of NYC all the time. What do you have left to talk about? The ferret menace? Redstate's Dan McLaughlin thinks that "most of the candidates played fairly well to their pre-existing images," and gives some credit to Romney for his attacks on the "sanctuary cities" issue. McLaughlin, a Giuliani supporter, thinks his man had "a very good night... despite the ugly eruption of his personal life" (that happens to him a lot, doesn't it?). And agrees with a very common point in all of these reactions: the night's big loser was Hollywood Fred Thompson, who wasn't up to debating and who chose instead to spend the night on Jay Leno's couch. I saw gifted candidates. I saw correct-thinking candidates. But I never saw both these traits in the same person. Granted, I was just called up from AAA ball to cover this major league event, but I’m telling you our bench is just not that deep. Somewhere, somehow, conservatism has gone astray at the highest levels of the movement. Where are our leaders? Johnson, speaking for the base, was encouraged by all the talk of immigration, and particularly by Mitt Romney's "channeling Tom Tancredo" -- though he doesn't trust Multiple Choice Mitt ("an ambitious man") to stick by Tancredo-ist positions for a moment longer than he deems it politically expedient. On Iraq, meanwhile, Johnson is annoyed by the perception that "most of the candidates talked more about how soon we could withdraw than of how important it is to win." If Johnson really does speak for the base, his analysis casts the right's field in an interesting light. On stage in Durham last night, they tried as best they could to toe the movement conservative line, offering the platitudes and positions Republican candidates are expected by the conservative establishment to express. Yet there may have seemed to be a lack of conviction in it all -- maybe the candidates are demoralized to find themselves caught between the intensity of the conservative base's demands on the one hand, and the widespread disapproval of the American public on the other. All told, by the end of the evening I was left depressed, unable to see conviction, correctness and charisma emerge in a single candidate. This depression was made worse since all night long, the candidates had invoked Ronald Reagan -- the exemplar of conviction, correctness and charisma for the conservative movement. They invoked him in an attempt to inherent some of his power -- to associate themselves with a dead hero of old. But the comparisons had the opposite effect. All eight on the stage seemed smaller in the shadow of the great man. The same shadow they were struggling to escape three months ago -- and no progress. Maybe they should try a surge. Seriously, what the hell is wrong with these people? Bad enough we've had to be subjected to years of vacuous chatter about which presidential candidates people would enjoy having beers with (despite the fact that neither of our last two presidents have actually been beer-drinkers). Now ABC, in all its investigatory splendor, demands that the public discuss whether we'd rather go on a road trip with Hillary or with Giuliani. For the record, neither. It would be weird and awkward and unpleasant to go on a road trip with either of them. I can't even imagine going on a road trip with Hillary Clinton or Rudy Giuliani. The hypothetical has no conceivable bearing on anything even approaching reality. You might as well ask whether I'd prefer Hillary or Rudy as a ham sandwich. Yeah, I'm no fun. But really -- ugh. Democrats have already responded to the charge by saying that they would have passed a lot of bills if not for Republican obstruction. The solution, they will say, is for voters to remove enough Republican senators that no more filibusters will be possible, and to take the veto out of Republican hands. This advice will fall on receptive ears. Republicans should shift their focus from the Democratic pass/fail record to the underlying reason for it. Democratic bills are failing because they are too far left to win strong bipartisan support. This Congress has tried to raise taxes, to force taxpayers to finance the killing of human embryos, to micromanage the war, and to move toward nationalized health care. It is a Congress that wants to do much too much: in short, a liberal Congress. Maybe that’s what Republicans should call it. The problem for conservatives is that all of these Democratic positions (no matter how the right caricatures them) are majoritarian ones. The reason the bills aren't getting bipartisan support is because the Republicans aren't a majoritarian party; they're increasingly a fringe party. It's nice to have the courage of your convictions, but there's a fine line between courage and self-destructiveness.